Earlier today, iFixit conducted a teardown the new Magic Keyboard, Magic Trackpad 2 and Magic Mouse 2. They've now followed that up with a teardown of the brand new 21.5-inch 4K iMac, and while the majority of the insides are the same as last year's model, there are some notable differences. First, the teardown found that the new iMac's 4K display is manufactured by LG. The new display is DCI-P3, which features a wider color gamut than the more standard sRGB. The new iMac is one of the few devices that allows consumers to experience the new display technology. Apple has also removed the empty PCIe SSD slot that was featured in the late 2013 iMac, which means that do-it-yourself upgraders won't be able to upgrade their machine easily. In 2012, Apple featured empty solder pads where the SSD slot would go, but in 2013 added an empty SSD slot. iFixit notes that users who want to add a Fusion Drive will either have to configure it at purchase or solder it on themselves. 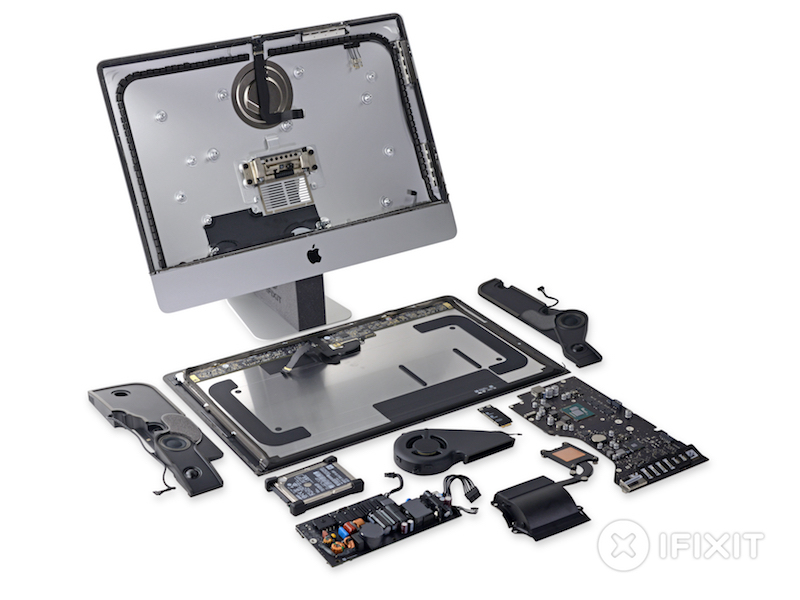 Overall, iFixit gave the new 21.5-inch iMac a repairability score of 1 out of 10, which means that the new desktop computer is extremely difficult to repair. Like other iMacs, the soldered-on CPU, logic board and fused-together glass and Retina Display contribute to how difficult the new desktop is to repair. ifixit have to fork out the $$ for their deconstruction machines as they are not getting any more (I think) thanks to their breaking of an Apple NDA a few weeks ago. Serves them right. Apple should come down on NDA breakers and make them wish they were never born. I would have taken ifixit to court if I was Apple. ifixit got off lightly with only their dev account banned. What ifixit did was stupid and I was surprised to see them being so unprofessional and irresponsible. However, I wouldn't want to wish them bad, nor to have a multi-billion company like Apple squash them out of the earth. I've been enjoying iFixit's work for many years, it's invaluable for anyone trying to upgrade/fix their own stuff, and I don't think there are many other great sites. the iMac has been an abomination ever since they dropped the superdrive and made it appear to be thinner without really being thinner. Isn't this the same iFixit that lied and broke their NDA in order to get advertising clicks, and then tried to blame their lazily-ignored and non-updated app on Apple's software and accused iOS of having bugs which broke it? Sorry, but I am forced to give them a respectability score of 1 out of 10, which means whatever trust I had in their opinion is extremely difficult to repair. Yeah, I doubt anyone cares whether you trust them or not. Love the iMac, hate that Apple is continuing down the road of making their products un-upgradable. Apple products are essentially just disposable now. "Apple has also removed the empty PCIe SSD slot that was featured in the late 2013 iMac, which means that do-it-yourself upgraders won't be able to upgrade their machine easily." "...iFixit notes that users who want to add a Fusion Drive will either have to configure it at purchase or solder it on themselves." Solder a hard drive? Are you fricking kidding me? Just when we thought the 5400rpm fiasco couldn't get any worse, wow just wow. LOL @ everyone bashing ifixit - they do the apple community a service. You act like they peed in your corn flakes. It's not sad at all. Soldered components make them more reliable, reducing the need for maintenance. They're also much more recyclable these days. Buy the RAM you want up front. There are plenty of companies who buy used Macs, the money for which can go towards a new one. This penchant for upgradeability is so '80s/'90s. Come on up to this century. Except for when things fail (e.g. SSDs fail) you've now got to replace the whole logic board. When anything fails you've pretty much got to replace the whole thing. Thats not better for the environment. Soldered joints can fail and connectors are fairly reliable anyway. Soldering Ram and storage reduces the useful life of a machine unless its maxed out at purchase. Who would buy a 4 year old Macbook given specs in 2010/2011 were 2 GB of ram, a slow harddrive etc? The reason they're somewhat worth something is that they can be upgraded with an SSD and 8GB of ram. It is very sad especially when we're talking desktop machines that have the space for things to be upgradable. Not only that but it made it cost effective to buy with lower specifications and upgrade. Thats what I did with my Mid 2012 Macbook. Cost me nearly $1000 less than a retina macbook with the specs I have now. The penchant for disposable computing should be in the past. We're entering a world where we should be extending the useful life of hardware, making it last longer and making it easier to replace individual components when they fail. Its not about anything other than making more money for Apple. Now anyone who wants to upgrade, you've got to pay Apple over the top prices to begin with. Then if an individual component fails (e.g. the soldered SSD) you've got to replace the entire logic board meaning using energy to both create a new one and energy to recycle the old one, instead of just replacing the SSD, which uses a lot less energy to create and recycle the old one. Then as theres no ability to upgrade the machine as time goes on, if you realise that the machine you bought doesn't have enough ram or HDD 3/4 years down the track, instead just upgrading, you've got to pay Apple for a whole new machine. Then because the machine has outdated specs and no upgrade path, its worth a lot less on the resale value because the second hand market doesn't want the old machine. Oh and not to mention that solder joints can also fill.. especially poor quality soldered joints. Look no further than the poor quality iBook G4 solder joints that lead to a huge number of GPU failures. Yes there is a slight disadvantage in connectors failing, but in all my time of maintaining machines, I've seen failed SSDs, failed HDDs but not the connector (on the logic board) failing. I would agree with soldered components in machines where thinness is the aim of the game (Macbook Retina, Macbook Air) but not in desktop machines. iFixit always spends their own money for the teardown machines. It's no big deal when you consider they're also practiced at putting them back together. That ATV incident was a one-off, where they "bought" (at a steep developer discount) a unit instead of waiting for the retail version, to get the jump on their competition. And, yes, that was arsehattery on the part of the iFixit team and an overreaction on Apple's part. Oh get over the NDA crap. If they had claimed they did nothing wrong, then maybe. They admitted they were wrong. Move on. As far as the new computers Apple produces... Poop on them. No upgrading? Psh.